It’s holiday party season, which means plenty of togetherness with family and friends. But for party hosts, it also means a lot of messiness to clean up after the guests have gone! Give your home a fresh start in time for the new year – or maybe just your next party – with easy holiday cleaning tips! In this video, Michael Silva-Nash, the executive vice president of Molly Maid Greater Little Rock, appears on KARK-TV to share the tips you need to efficiently clean up after a party, throughout the holidays, and ring in the new year in a clean and organized fashion. Saying goodbye to unwanted gifts. It's the thought that counts, but don't let good intentions add additional clutter to your post-holiday house. Make a clean break, and return gifts that didn't work out. If it would be appropriate, consider giving those gifts to the charity of your choice. Holiday cleaning will be easier without those extra items. Collecting holiday cards. Go through the cards you got in the mail, and make a list of who sent them to you. Use this as a thank-you list or the start to your Christmas card list for next year. Then recycle cute cards by cutting the images, attaching string and using them as free gift tags. Throw the ones you don’t want in the recycling bin, and your after-party cleaning will be well underway. Cleaning the guest bedroom. Wash the bed sheets in warm or hot water with a capful of white vinegar to ensure they are fresh. While sheets are in the dryer, use your vacuum’s upholstery attachment to clean the mattress thoroughly, paying special attention to the seams. Replace the bedding, and fluff the pillows to make your next guests comfortable. Taking down those lights. When you do, you'll save yourself time next year if you put them away using one simple trick: wrap strings of lights around a piece of cardboard or a paper towel tube to keep them organized and easy to unravel next season. This also keeps you from being the neighbor who still has strings of outdoor Christmas lights up on Valentine's Day. Coordinating Christmas tree take-down and curbside pick-up. When is your trash pickup service collecting Christmas trees? Find out so you can get your tree curbside in accordance with the collection times. 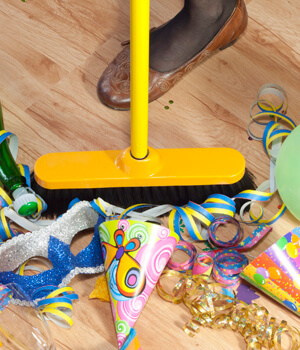 It’s easier to clean up after your party if you don’t have to worry about pine needles spreading through the house. Ready to schedule a service? Call (800) 654-9647 to speak with our friendly customer service representatives. Or SCHEDULE A FREE ESTIMATE today!